The Chicago Blackhawks on Thursday night did something they hadn't done since winning the Stanley Cup in 2010: won a first-round playoff series. 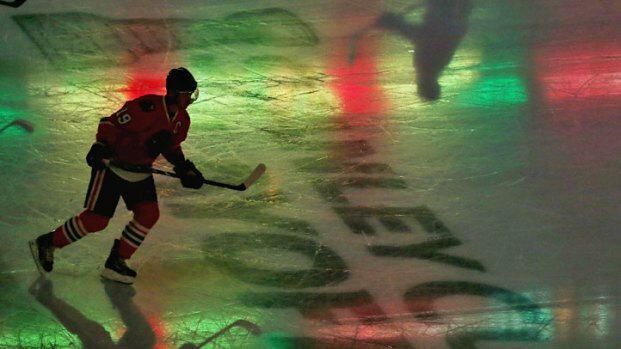 With a final score of 5-1, the Blackhawks sent the Minnesota Wild home from the United Center with thoughts of what could have been. The Hawks will face San Jose or Detroit in the next round if the Red Wings advance over Anaheim. The way the Blackhawks have dominated, anything less than a trip to the Stanley Cup finals would be a disappointment for them. They got off to a record start and captured the Presidents' Trophy for finishing with more points than any other team. Now, they're eyeing the biggest prize of all. And after bowing out in the first round the past two years, they sure are looking good. Marian Hossa scored twice to back a strong effort by goalie Corey Crawford. He scored off a feed from Jonathan Toews late in the first period. Marcus Kruger made it 2-0 with a wraparound early in the second, and Hossa chased the Wild's Josh Harding when he knocked in a rebound minutes later. Then, after Torrey Mitchell scored for Minnesota, Chicago's Andrew Shaw scored against Darcy Kuemper. Patrick Sharp added his fifth goal of the series early in the third period, and that was more than enough for Crawford. Coming off his second career playoff shutout, he saved 21 shots, and the Blackhawks became the third team to advance in this postseason, along with San Jose and Ottawa. They also bucked a recent trend of early exits for Presidents' Trophy winners. The team with the most regular-season points had been eliminated in the first round in three of the previous four years. The Wild were hoping to replicate what the Los Angeles Kings did last year and win the Stanley Cup as the eighth seed, but the Blackhawks simply had too much skill, speed and depth. The Wild were also short-handed after losing one of their top scorers in Dany Heatley to season-ending left shoulder surgery late in the season. They also had to get by without goalie Niklas Backstrom after he suffered a leg injury in warm-ups before Game 1. That forced the Wild to go with Harding, who played in just five games during the regular season after being diagnosed with multiple sclerosis last summer. And he also got banged up in this series. He left Game 4 after a collision with Toews in which his legs got straddled around the left goal post, and he wasn't sharp in this one, allowing three goals on 18 shots even though he was deemed well enough to start. Coach Mike Yeo turned to Kuemper after Hossa's second goal. And, for a moment, the Wild looked like they might get back into this one. Moments after Minnesota's Jared Spurgeon hit the right post, Mitchell ripped a one-timer past Crawford midway through the second period. But Shaw answered 35 seconds later with his first career playoff goal when he swept the puck in from a bad angle just to the right of the net, making it 4-1. Crawford, meanwhile, continued to erase doubts about his ability to perform in the postseason. That was a big question coming into this series after he let in several soft goals in last year's first-round loss to Phoenix. He's been nothing but solid in this series. He even had the fans chanting his name at several points. For example, when Crawford stopped a routine shot by Jason Pominville from the wing and scrambled back toward the middle of the net for a neat pad save against Mikko Koivu on the rebound. That foiled another power play by the Wild after they went 0 for 15 in the first four games. The Blackhawks took a 1-0 lead late in the first period when Hossa took a feed from Toews in the left circle and fired the puck between Harding's glove and the post. The assist gave Toews his first point of the playoffs. Kruger made it 2-0 when his wraparound deflected off Harding's pad and into the net for his first career playoff goal. The Associated Press' Andrew Seligman contributed to this report.